Hit it out of the park with a project developed by Grand Slam Software! [5 Stars] Very helpful. I coach high school and need to keep track of all three teams... Definitely buy this if you coach!! 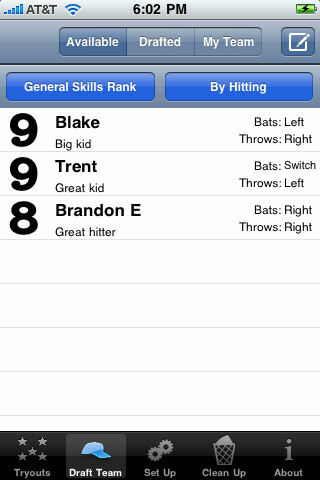 Baseball TryoutTracker is an application developed for the iPhone. 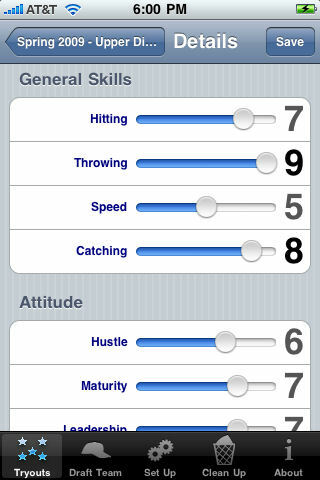 The TryoutTracker is a tool to help coaches evaluate players' skill levels in the areas of hitting, catching, throwing and speed. Each skill is ranked from one to five stars. You can also track if the player bats left or right handed and if the player throws left or right handed. Once you've ranked all of the players in a tryout you can take the information you've collected into your draft meeting. The players can be sorted based on the ratings you assigned to easily determine the best player for each skill needed on your team. You could also use it when scouting another team to track the performance of the players on the opposing teams! New in version 1.1 you can take pictures and add comments for each player. The comments entered are displayed on the draft screen underneath the player name to help you make your decision on which player to draft. A picture can be taken for each player being ranked. Taking a new picture will automatically overwrite the old one. New in version 1.2 are some critical stability fixes when working with largers lists of players. There is also a new "Overall" ranking when viewing the list of players to draft. The "Overall" ranking list will average the other four rankings to give you an overall performance indicator for the player. 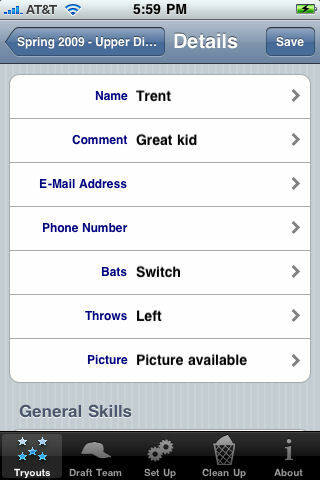 New in version 1.3 is the ability to designate a player as a switch hitter, use your camera roll to associate a picture with a player and send the player lists via e-mail. New in version 1.4 is the ability to move a player from one group to another. New in version 1.5 the ranking system has been changed to go from zero through nine and uses a slider instead of stars. There is an attitude and pitching skills section as well as a section for personal and educational information. 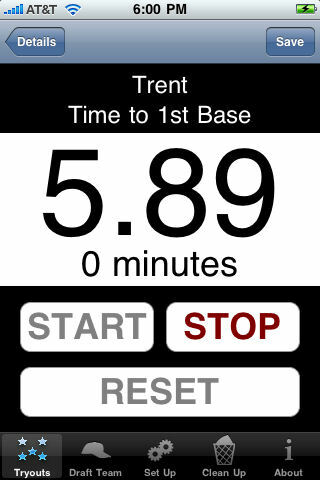 You can even use the TryoutTracker stopwatch to time the players running to the bases! New in version 1.6 are many additional tracking categories and a redesigned tracking interface. New in version 1.8 is the draft player screen has been slightly redesigned to make it easier to select the different filter options. The TryoutTracker is available on the iPhone App Store by searching for "tryouttracker". Once purchased for $2.99, it will download and install directly onto your iPhone and you'll be ready to begin! "No matter how good you are, you're going to lose one-third of your games. No matter how bad you are you're going to win one-third of your games. It's the other third that makes the difference.'"